This is the introduction from Dr. Jeff Gordon’s new book, A Death Prolonged. 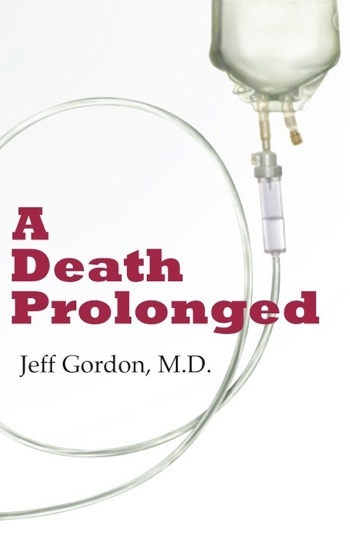 Dr. Gordon's agenda is pretty clear in this book - to get people to talk about end-of-life prefereneces. He uses a fictional account of a young physician who learns that high cost end-of-life care may not be synonymous with high quality care. She also learns that in a system with limited resoureces, high cost interventions in terminally ill patients are likely to shift resources away from cheaper preventive care. A. My greater concern is that we will try to sugar-coat the truth. Most Americans don’t make informed end-of-life decisions and end up receiving care that prolongs their suffering and consumes valuable resources. We must assert this truth frequently and to many audiences. I found that the “death panel” talks from last summer opened doors for meaningful discussions and allowed me to enlighten more people with the facts. We should attack ignorance with facts and thoughtful dialogue. “Spin doctors” underestimate the intellect of the American people. Let’s just tell the truth in a clear, sensitive, and unapologetic way, and frame end-of-life discussion in terms of informed consent: the risks, benefits, and alternatives. "Facts are stubborn things; and whatever may be our wishes, our inclinations, or the dictates of our passion, they cannot alter the state of facts and evidence. John Adams"
Nice interview, and refreshing commentary on the need to have an open public discussion about the costs (emotional as well as financial) of aggressive, expensive treatment near the end of life. Hospitalists like Jeff Gordon are on the front lines of this struggle. In our system, hospitalists and PC docs are linking arms (and information systems) to reduce unwanted "care" and costs. Fiction like this can indeed make life easier for everyone as they struggle to "embrace and feel the truth." Real-life stories, on the other hand, can be useful too, even if (or just because) they sometimes make a few people squirm. Thanks for the heads up on what sounds like an important book. I love the idea of using fiction to help the general public think differently about health care issues. I imagine non-fiction on this subject tends to be read mostly by the choir. My fantasy - that this fictional account and/or others could have as much impact on the revaluing of health care costs/interventions v. human costs in this country as Uncle Tom's Cabin did for the rethinking of slavery. I really like the use of the blog for short interviews like this. I love his answer on the value of fiction. The potential cost savings from better end-of-life care is such a difficult discussion to have. Even if you mean it well, people will assume you are "trying to kill granny." I think the best way to talk about it is to promote high quality end-of-life care and let the cost savings happen on their own as a side effect of good patient-centered end-of-life care. It should always be an afterthought. The discussion on end of life care needs to start in the physicians office before a crisis is reached. Then the discussion needs to carry over into the hospital and the bottom line is that we have to stop providing and spending money on care that is futile and helps no one.